The first official "In a Bklyn Minute" Video features photos from around Ground Zero (World Trade Center / WTC) taken on October 3rd, 2001 and video footage from the same locations recorded on September 14th, 2011 - 10 years later. This week marked 10 years since 9/11. I wanted to be back in New York (from Berlin) by this date, so I could more directly connect with what I consider to be part of me - even though I hadn't been in the towers, nor lost anyone. "Ground Zero - WTC 2001/2011" - In A Bklyn Minute (Week 72) from Luci Westphal on Vimeo. 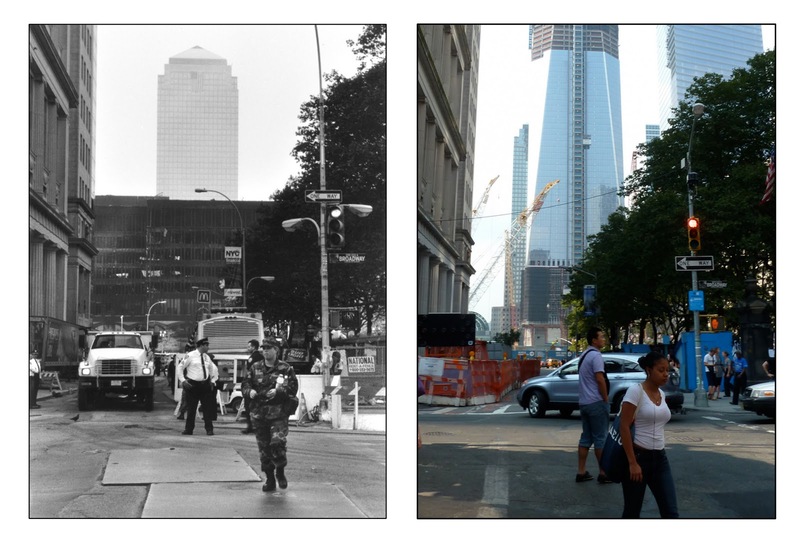 On October 3, 2001 my friend Kyra tried to get as close as possible to Ground Zero for the first time. Before we could only get as close as Houston Street. We are both photographers and we looked at the still smoking mangled carcass of buildings and the free standing walls through our cameras. We looked at the police officers and Mitmenschen (is there an English word for the other humans around you? I don't just mean people, but with-people) through our cameras. We looked at was too large and devastating to grasp through our cameras. There was the danger of looking like an a**hole tourist trying to get a snapshot. But I'll be frank with you, I think I really needed the distance of the camera to look at this at all. And I don't think I consciously even framed up or tried to get shots. It was just mechanical to walk around and witness. This week I returned with my video camera in the middle of a busy and muggy afternoon and tried to find the same spots again to explore what it looks and feels like 10 years later. There were a lot of people with cameras, a lot of tourists, a lot of office workers, still a lot of police, a lot of high school students, a lot of double-decker tourist buses, a lot of cell phones, white headphones, a lot of construction and several times a warm look from a police officer after he looked at one of my photos and tried to help me figure out where that point-of-view might have been. For those moments it felt like: hey, remember, we were here together and it was horrible, but do you also remember that for a short little while we all felt connected and compassionate? I almost used a lovely piece of music by Spleenveil for this - but opted to go with the natural street sounds. It probably would have been more effective to have silence or the subdued real sounds from October 2001 with the photos - but cutting back and forth between sounds would have been too much, I'm sure. This video is cut together a little bit faster than I wanted to - but as usual it was hard to make choices. Later today I will upload a longer slower version with about 3 times as many images. Also please remember: this is not television, this is web video and you are in charge: you can always pause and look at something for longer. Last but not least, I'll post some of these pictures on my Flickr account. - Michael Imperioli is in the very last shot across the street. And now you can't recognize him. I just noticed as I walked past him later. - During this shoot I dropped my camera, which is now broken and I've got a problem. Music Monday: Little Dragon - "Ritual Union"